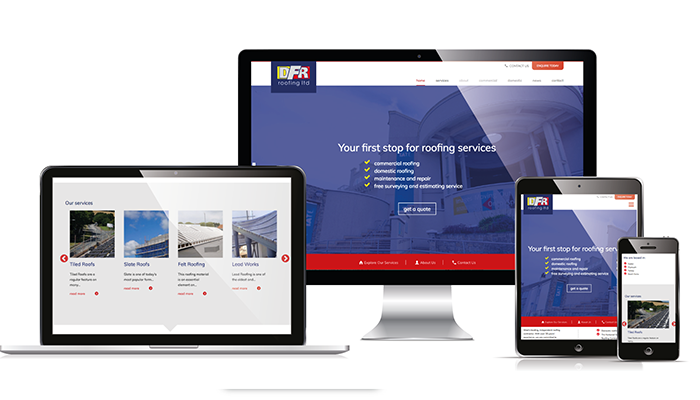 DFR Roofing, a well-known roofing company covering all of the South West and beyond, needed marketing support to boost their profile within an increasingly competitive sector. From updating the design and navigation, to ensuring the copy was relevant and informative, we designed and built a website to be used as a tool for the company to showcase its work going forward. It is also mobile responsive, meaning it can be viewed easily when on the move on both tablets and smartphones – perfect for when the DFR team is onsite. Maintaining the colours from the current brand, the website is also consistent with the company’s uniforms, stationery and vehicles. By ensuring there were plenty of images and case studies of recent projects, the website also demonstrates the range of services provided by the company – from commercial to domestic projects. We are also putting a maintenance package in place to ensure the content is always up-to-date and that the site ranks highly on well-known search engines.